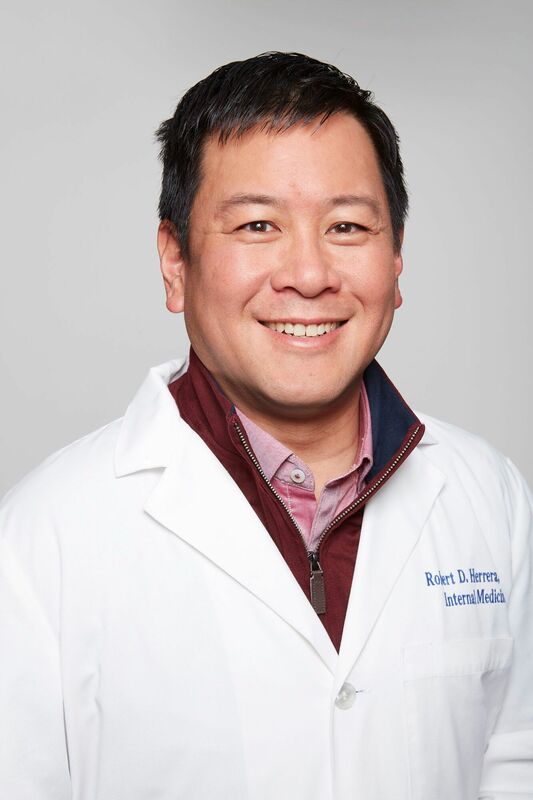 Dr. Robert D. Herrera is an experienced primary care physician who has been caring for patients and their families since 1997. Dr. Herrera received his bachelor’s degree in biology and his medical degree from Georgetown University in Washington, D.C. He went on to complete a combined internship and residency in internal medicine at Emory University. Dr. Herrera believes the most important goal for physicians is to help others, and he works hard to help his patients be as healthy as they can be. This includes spending as much time as possible with each patient. He is a skilled listener, which helps him develop relationships with his patients. This allows him to personalize his advice about preventive health care beyond the usual age and gender standards. Dr. Herrera strives to understand not only his patients’ current medical issues, but to provide individualized advice about healthy lifestyle habits and other preventive strategies that can help maintain good health. Dr. Herrera grew up in a suburban area in New York and came to Atlanta from Washington, D.C. He is married and has two children. When he isn’t caring for patients, he enjoys spending time with his family and friends. He also enjoys playing tennis, especially with his family. Dr. Herrera sees patients age 18 and up.